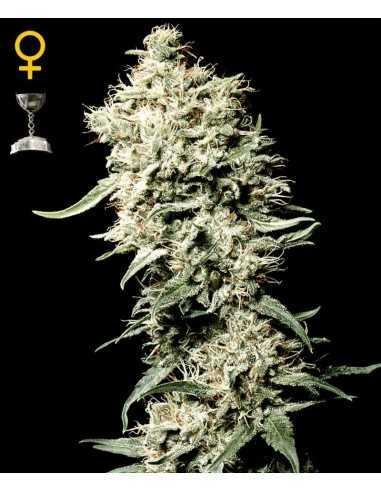 White Rhino may be a small plant, but the productivity is impressive, for she has the potential to yield up to 900g/m² in an indoor setup, respectively 1.2kg when grown outdoors. Indoors it takes her 9 weeks to produce those large, dense and elongated buds. As the name already suggests, the buds are riddled with so many resin glands, that they look as if it had been snowing. If you produce your own hash or BHO, White Rhino will serve very well. Furthermore she is not stingy when it comes to the cannabinoid load and flavor. The buds are laden with 20% THC and roughly 0.1% CBD and release a sweet and fruity taste when smoked. Savored in moderate amounts the induced high relaxes the body, boosts the creativity and makes you talkative, but consumed in a higher quantity she will flag you down and make you drowsy to an extend that your longing for a slumber will become overwhelming.